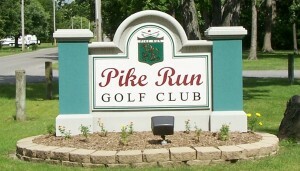 Welcome to Pike Run Golf Club! Toledo golf at its finest..
by Lima News readers 2016. West Central Ohio (Lima, Findlay, Defiance) golf enthusiasts know, quality golf and memorable challenges await you at Pike Run Golf Club. The well maintained 18 hole golf course is conveniently located just 3 miles North of Ottawa, Ohio and boasts some of the best greens in the area. Pike Run has everything you need to enjoy a relaxing game of Toledo golf. Pike Run Golf Club offers some of the best golf equipment and apparel on the market. Stop by our fully-stocked Pro Shop before or after your round and browse through all the name brand merchandise. Pike Run Golf Club also has a driving range you don’t want to miss. Why you ask? Because even youngsters need to warm-up their muscles. Once you’ve played at this Toledo golf course, you’re going to want to return again and again to conquer this shot-maker’s course. Take advantage of great stay and play opportunities iwth the House of Rose n Garden bed and breakfast.Located rural North West Ohio, this bed and breakfast offers unique features such as an indoor pool, meeting rooms, and shuttle service. Golfers of all ages and handicaps can enjoy this well manicured golf course where every hole is a new experience. Starting with the tough par 4 dog leg #13 hole, then the signature par 3 #14 hole and finally the sloping green on #15, Pike Run Golf Club has its own version of “AMEN” Corner. We welcome you to browse our site for more information on this outstanding Toledo Golf Course, to book a tee time, view our photo gallery or sign up for our e-club to receive course specials and promotions.